Contact Viet Fun Travel to have a good trip with a 5-days tour from Ho Chi Minh City. 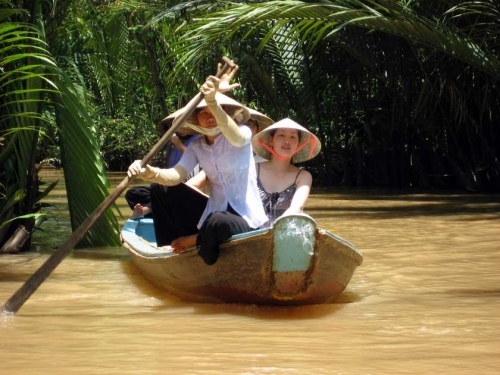 It takes 5 days to explore many ideal destinations in Saigon, Mekong Delta, Cu Chi, Mui Ne. You will see magnificent French colonial architecture of Reunification Hall, Notre Dame Cathedral, General Post Office and City Hall. Visiting Unicorn Island, Turtle Island and enjoy the typical folk music in Mekong Delta are great experiences for your trip. Moreover, you will explore unique architecture and heroic history of local people in Cu Chi Tunnels. Mui Ne Beach is an interesting destination where you can’t miss in this trip. 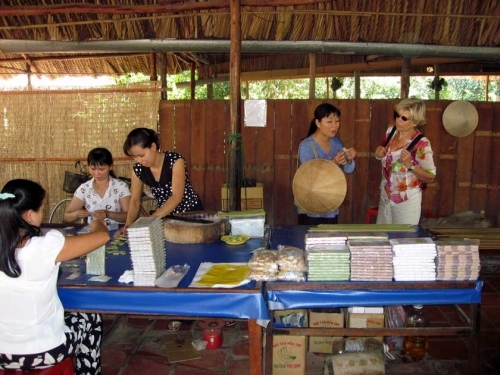 Enjoy the typical folk music and coconut candy workshops. Our guide & driver will pick you up from airport and transfer you to hotel. 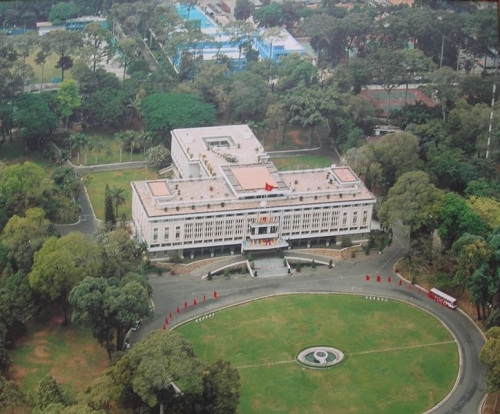 This address today still holds many important functions in Saigon. We have guide who speaks your language to tell you important historical facts about this building and some French colonial structures including the Notre Dame Cathedral (Located in the heart of the city, this cathedral was built by the French in the late 1877s. A large statue of the Virgin Mary greets you as you walk into this neo-Romanesque cathedral, adorned by two tall spires flanking either side). 06.30pm: Watch water puppet show. Included: Air con tourist bus or private transport, airport transfer, English speaking guide in tour, entrance fees, 01 Aquafina water bottle, lunch, dinner cruise, water puppet show, transport transfer to water puppet show & dinner cruise and accommodation in Saigon/Ho Chi Minh City. 08.00am, travel by air con tourist bus or private transport to My Tho – 9:30am, board a wooden motor boat to Unicorn Island. On this boat along the river’s bank, you’ll be passing through natural creeks and quiet villages and watch rural people going to work. You will see an interesting fishermen's port, stilt houses. After that we’ll take you to a village where you can smell the flavor of coconut candies being made many yards away. This is a great chance to witness how village people make candy and handcrafted items from coconuts. You might learn that those people can amazingly make dozens of useful products out of coconut trees. As your journey ends, we will visit Dong Tam snake farm before transfering you to your hotel in Saigon. Have dinner at the BBQ Restaurant. Included: Air con tourist bus or private transport & boat trips, English speaking guide in tour, entrance fees, breakfast at hotel, lunch, dinner, 01 Aquafina water bottle and accommodation in Saigon/Ho Chi Minh City. Leaving the hustle and bustle of Saigon behind we journey 2 ½ hours west towards the Cambodian border bound for the Cu Chi Tunnels. The Cu Chi tunnels were built by local fighters during the Indochina conflict as a base from which the Viet Cong could operate from close to the Southern Vietnamese capital. The location proved of significant strategic importance, at the end of the infamous Ho Chi Minh Trail and within striking distance of the southern Vietnam capital. Initial construction started in 1948 when the Viet Minh required somewhere to hide from French air attacks and by 1965, the tunnel complex was estimated to consist of 200km's of tunnels. It included, hospitals, schools, meeting rooms, kitchens and sleeping quarters. Life was difficult for the inhabitants and to protect against outside intruders bobby traps were laid throughout the complex. Today the Vietnamese government have preserved approximately 75 kilometres of the tunnels as a memorial park, in some areas tunnels have been widened and low powered lights installed so that western tourists can now fit through the complex. Following our step back in modern history we return to the "chao" of Ho Chi Minh City. Included: Air con tourist bus or private transport, English speaking guide in tour, entrance fees, 01 Aquafina water bottle, breakfast at hotel, lunch and accommodation in Saigon/Ho Chi Minh City. Excluded: Dinner, drinks, gun shooting, travel insurance, tips and personal expenses. 08.30am our guide & driver will pick you up at your hotel in Saigon/Ho Chi Minh City and transfer to Mui Ne by air con tourist bus or private transport. It takes 4 hours. You have a lunch at the local restaurant in Phan Thiet. Free time on the beach. Evening: You have a dinner with seafood at the local restautant. Included: Air con tourist bus or private transport Sai Gon – Mui Ne, English speaking guide in tour, breakfast at hotel/resort, lunch, dinner and accommodation in Muine. 04.30am – Transport and English tour guide pick you up from your resort/hotel to visit Muine Beach. 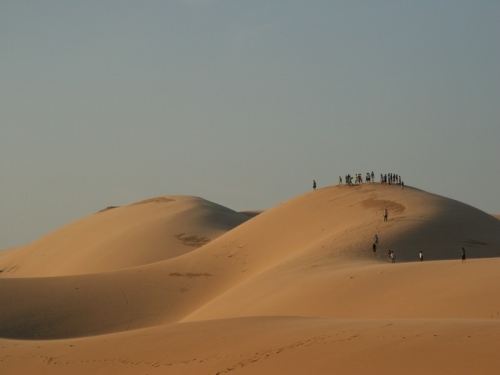 You will be fulfilled by the beautiful white sand dune. It is more romantic time for seeing the sunrise, slip on the sand. Moreover, in the middle of the white sand dune there is Lotus Lake – lotus is one of the famous flowers in Viet Nam. Not only visiting white sand dune, customers will have a chance to visit Red/Yellow sand dune. From the top of the Yellow one, you can see all of the scenery of Mui ne when you can discover the daily activities of the fishing farm. Then we will stop at the Fairy Stream where you can not miss in Mui Ne because of the really nice place. Included: Air con tourist bus or private transport Muine - Sai Gon, breakfast at resort/hotel, lunch, English speaking guide in tour and entrance fees. Note: You will have an opportunity to explore the unique beauty of Ho Chi Minh City on hired motorbikes and enjoy great dishes from snails in small diners. Let's contact us to get more information for your enjoyment in Ho Chi Minh City. Air con tourist bus in tour and Saigon - Muine - Saigon. Transport transfers to water puppet show and dinner cruise in Saigon. 04 breakfasts, 05 lunches and 03 dinners. Accommodation in Saigon & Muine. Private transport in tour and Saigon - Muine - Saigon. Print your voucher; locate the voucher in your travel confirmation e-mail or in " show ticket link" on the site and show voucher to guide. You use private transport in tour. We will free pick-up at hotel in the central areas in Muine. If your hotel's location is on these streets such as De Tham St, Bui Vien St, Pham Ngu Lao St, Le Lai St, Bui Thi Xuan St, Pham Hong Thai St, Thu Khoa Huan, Nguyen An Ninh St, Cong Quynh St, Ly Tu Trong St…Dist 1, HCMC, Vietnam, we will free pick-up from your hotel at (if you choose standard type), please provide your hotel address and the name of hotel where you will stay at.